CTV Calgary Morning Live's Lane Fraser visits a variety of showhomes in Calgary and the surrounding area over the next few months. Lane talks with the builders, highlights the different elements from these fabulous homes and learns more about the neighbourhoods they are in. Shane Multi-Family award winning condominium community The Mark 101 offers unique designs in convenient Sage Hill. Learn about Jayman Built’s commitment to a more sustainable future in today’s Showhome Parade. Calbridge Homes proudly presents it's estate Homes in Rocky Vale Green with mountain views & many amenities. Our Showhome parade tours The Chelsea from Sterling Homes in the lake community of Harmony. Morrison Homes Multi-Family is excited to showcase its unique condominium development in Sage Hill. Our Showhome parade visits the community of Heritage Hills and tours the Hillside Showhome from Stepper Homes. The new Westman Village from Jayman Built offers a Village Centre with fitness, library, games room and so much more. 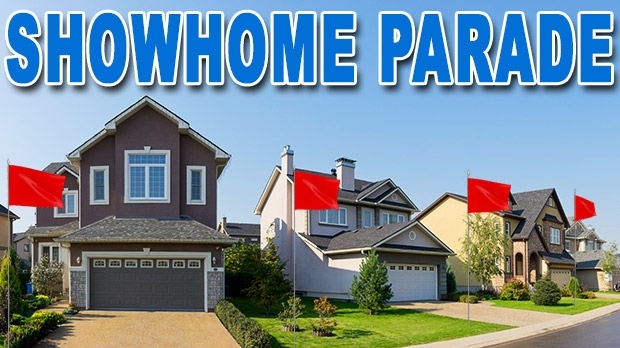 Shawnee Park in Southwest Calgary offers many conveniences including nearby shopping, schools and easy C-Train access. Mahogany is Calgary's top selling new lake community and it features homes for every budget and lifestyle. The community of Bayview in Airdrie offers walking paths, canals and much more for active families to live and grow.